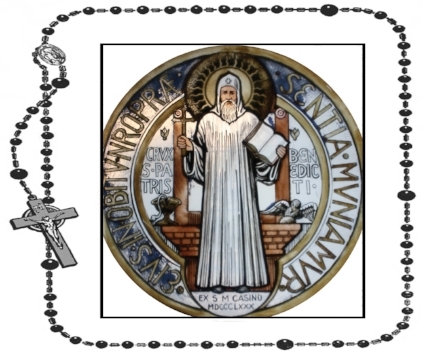 The chaplet construction was based on the writings of Saint Benedict. Also, there are seven beads in each group to represent the seven sacraments. To receive the spiritual benefits, the medal (blessed by a priest using the prayer of exorcism) may be devoutly worn around the neck, attached to a scapular or rosary or carried in a pocket. It is often placed on the corners of fields or building foundations (or attached to automobiles) to call down God's blessing and protection through the intercession of Saint Benedict. In Benedictine prayer, we empty ourselves to make room for the contemplative love of God. Gracious and Holy Father, give us the wisdom to discover You, the intelligence to understand You, the diligence to seek after You, the patience to wait for You, eyes to behold You, a heart to meditate upon You and a life to proclaim You; through the power of the Spirit of Jesus, our Lord. Amen. God our Father, in Your goodness, grant me the intellect to comprehend You, the perception to discern You and the reason to appreciate You. Teach me to walk in Your ways, O Lord, with the Gospel as my guide. In Your kindness, endow me with the intelligence to look for You, the wisdom to discover You and the spirit to comprehend You. May Your holy cross be my light; may satan never be my guide. In Your graciousness, bestow on me a heart to contemplate You, ears to hear You, eyes to see You and a tongue to speak of You. May I be strengthened by Your presence, O Lord, at the hour of death. In Your mercy, confer on me a conversation pleasing to You, the patience to wait for You and the perseverance to long for You. Begone satan! Never tempt me with your vanities; for what you offer is evil. Grant me a perfect end in Your Holy Presence, O Lord. Amen.